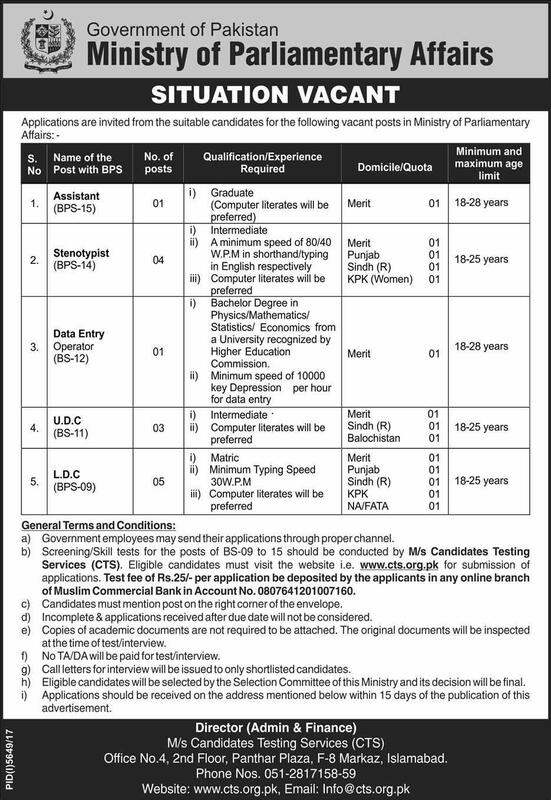 Ministry of Parliamentary Affairs Government of the Pakistan has announced new jobs in Daily Express Newspaper dated 12-04-2018. Candidates can apply for Ministry of Parliamentary Affairs Jobs 2018 against Assistant, Stenotypist, Data Entry Operator, Upper Division Clerk and Lower Division Clerk. The Recruitment Process will be made through Central Testing Service Agency and Candidates are Directed to visit Central Testing Service Website for more details, Application Form and Fee Deposit. Government Employees may send their applications through proper Channel.